Project Cargo Network (PCN) have introduced Lion Shipping & Chartering Ltd as new members in Romania. Located in Constanta, the company were recommended by current PCN members during their application. Managing Director, Mr. Dragos Vieru: "Lion Shipping & Chartering was established in 2007 in Constanta with the core activity of shipping solutions for the project cargo & heavy lift market. We are certified by Bureau Veritas covering all processes deployed for ship agency services & freight forwarding according to following standards: ISO 9001:2008 - Quality Management System; ISO 14001:2004 - Environmental Management System; OHSAS 18001:2007 - Occupational Health & Safety Management System; and ISO/IEC 27001:2013 - Information Security Management System. 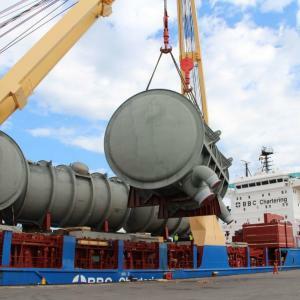 We supply port agency and forwarding services in the ports of Medgidia, Basarabi, Midia, Constanta and Mangalia and our team offers full, tailored solutions for project and heavy lift logistics from initial planning to the final delivery and facility start up." Please click here for photos and details of the numerous successful projects handled by Lion Shipping & Chartering (as exampled in the photo above) and click here for some great videos of their work.